Three months after the first vote was cast in the Iowa caucus, Indiana will have an opportunity as the only state to cast their vote for the primary on May 3. Indiana has been in the spotlight the last two weeks, as candidates criss-crossed the state picking up endorsements ahead of the primary. The odds-on favorites for the state are the frontrunners Hillary Clinton and Donald Trump, who are heading in with big wins in the Northeast, but both Ted Cruz and Bernie Sanders are looking to pick up big upsets. In the latest NBC/Marist Poll taken from April 26-28 shows Trump ahead of Cruz by 15 percent, and Hillary Clinton ahead of Bernie Sanders by 4 points. In one of the most memorable gaffes of this election cycle, Ted Cruz took an easy called the basketball hoop a “ring” during a rally at the Hoosier Gym Community Center in Knightstown, Indiana—the location where famed movie Hoosier was filmed. The gaffe underscores Cruz’s difficulty relating to the everyday voter in the same way as his opponent Donald Trump. Brushing aside Knight’s controversial past—including being fired from Indiana University for “uncivil, defiant and unacceptable behavior”—he’s still a living legend in the state, and it’ll be interesting to see if it affects the way that Indiana votes. Second—he got the endorsement of Governor Mike Pense, but the endorsement was tempered by lengthy praise for frontrunner Donald Trump. 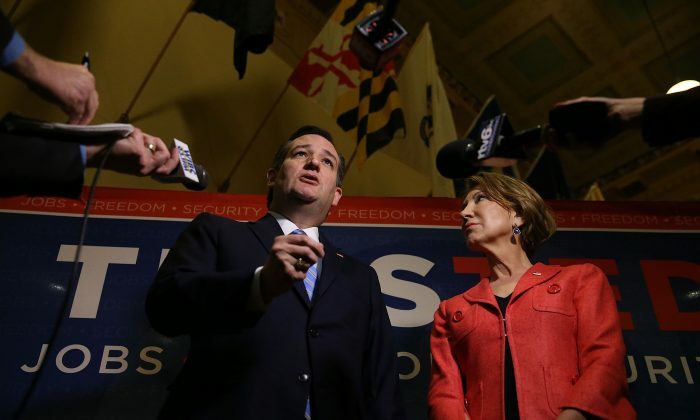 The biggest strategical move by the Cruz campaign was the announcement of his running mate Carly Fiorina to try to take votes from Trump, especially with Trump’s low approval rating with women voters. In a movement that signals the Democratic Primary is looking towards a general election, Hillary Clinton has stopped spending money on ads in the upcoming primaries, and Bernie Sanders has lessened his spending in Indiana as well. The campaign announced it was cutting $200,000 from its initial $1.4 million ad buyout. The cutbacks came a day after the campaign announced it was also cutting staff from states that had already voted. Clinton has all but started stumping for a general election, hitting Donald Trump more and more, and Sanders less and less.